Pam gives two great tips for starting off this quilt. Get it done faster by buying charm packs, or take advantage of the opportunity to use up some scraps! Either way is a win. 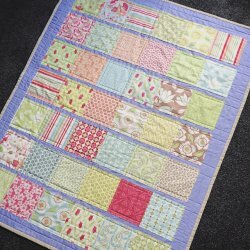 This tutorial teaches you how to create a specific quilt, while also acting as a guide for teaching you skills you will use in future quilts. In her guide, Pam provides a list of great resources to look to when the quilt top is complete and you are ready to finish off the quilt. Bonus: This quilt was completed with a standard sewing machine! Do the quilting yourself!